DGM & Panegyric are proud to present the third in a series of King Crimson high quality vinyl reissues with the September release of “Lizard”. The album’s return to the 12” vinyl format is newly cut from masters approved by Robert Fripp. Manufactured on 200 gram super-heavyweight vinyl & housed in a reprint of the original beautiful gatefold sleeve. 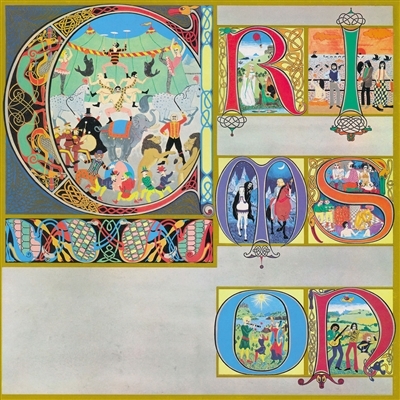 “Lizard” – King Crimson’s third studio album & second recording of 1970, was, like its predecessor “In the Wake of Poseidon”, the product of a studio band. It was also the first Crimson album for which Robert Fripp provided all of the music. Remarkably self-contained & sounding somewhat atypical for a King Crimson album – even by the standards of a band that rarely sounded similar from album to album, “Lizard” is an often overlooked & under-appreciated gem from their early years. Certainly at the time of release, anyone expecting an extension of the soundscapes introduced & explored on the band’s earlier two albums was in for a surprise. “Lizard” featured a lighter, more delicate sound than the earlier albums – an approach perhaps necessitated by an extended instrumental lineup. The expanded range of instruments allowed for intricately interwoven instrumental passages – with Fripp’s guitar & Tippett’s piano pleasingly to the fore – and this combination, along with the prominence afforded to Mel Collins & the guest players on the album’s main title suite, led some to believe that Fripp was guiding Crimson towards the world of jazz & away from rock altogether. But such claims were misguided. Crimson was, as ever, seeking to expand the vocabulary of rock music & “Lizard” was, in some ways, the band’s most ambitious album to date. As this lineup never toured, very little of the material was performed live & “Lizard” remained a product of the studio environment & the musicians who performed on it. “Lizard” remains a fascinating, intriguing album – an album only a band called King Crimson could make – even if it was a very different King Crimson to that which had gone before or would come after. The album’s reputation has undergone a serious re-evaluation in recent years, due in no small part to the overwhelmingly positive nature of the reception given to Steven Wilson & Robert Fripp’s 2009 CD/DVD-A edition. As a result the album has never been as popular in its 42 years’ history.